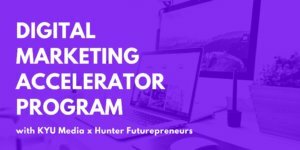 This Digital Accelerator is suitable for local youth and other interested tech savvy people who want something new, exciting and challenging, and give all who successfully complete a great change of employment or self-employment. Show up, challenge yourself and develop new skills about digital marketing, then do something awesome with what you’ve learned – like start a business or change your career path! For weeks 1 and 2 you will be required to attend one day per week at The Green Room Warners Bay. For weeks 3-8 you will be required to attend two days per week at The Green Room Warners Bay. – any 16 -24 year old wanting to take control of their future! A curious mind, entrepreneurial mindset, and a laptop! This program has limited spots (25) available and is open to all 16- 24 year old’s. There is no cost as this is FULLY FUNDED BY THE COMMONWEALTH GOVERNMENT. The program runs Thursday’s from 9:30am – 4pm at The Green Room, starting April 18th, 2019 and finishing June 6th, 2019.